Nourison is inspired by the cosmic consciousness and imagery from outer space with the creation of the Celestial Collection. The rugs are inspired by the heavens and the stars and the dramatic beauty that appears in both the daytime and night sky. Beautifully selected patterns and colour swirl together in an illusory and captivating style which makes each Celestial rug a feature piece for your home. Each of the beautifully designed rugs in the Celestial Collection by Nourison incorporates vivid colour, original style and a sense of luxury which is perfect for many styles of space. The cosmos comes to life on each of these glittering rugs and the richness of the colours makes them a statement piece for your home. The rugs swirling patterns given them a sense of motion which makes them even more captivating and every time you look, you’ll find new elements of your Celestial rug to appreciate. A splash of energy and cosmic style becomes part of your interior design when you choose a Nourison Celestial Collection rug and there are a range of different styles to choose from. 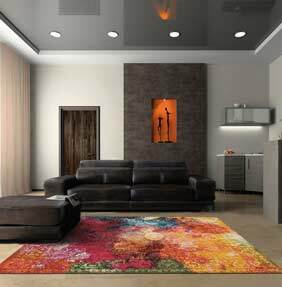 The materials chosen ensure the rugs are hard-wearing so perfect for even high traffic areas in the home and they are also non-shedding and very easy to keep clean. Nourison is one of the leading companies in rug and carpet manufacturing and these Celestial rugs allow you to enjoy a piece of their exceptional collection in your home.